Saturday, June 16 from 3pm-6pm. Chris Berg & I would like to invite our clients to come watch a movie with us. Didn’t we just have one? Well, yes…yes, we did and we had so much fun that we want to do it again! Which one now? Well, it involves some Disney, NO CAPES, a family, and a very long wait! Come join us for The Incredibles 2!! We do need rsvp’s, and those can be made via Facebook or email to either Chris Berg (cberg@pcmloan.com) or Tracie DeMars (traciedemars@aol.com) for right now. We are always excited for the client appreciation events, and it’s almost as exciting for us as getting someone’s offer accepted on their dream home… or getting an offer signed around on the home they’re selling. I know people think that Real Estate is about houses, and while, yes…that is partly correct, it isn’t completely correct. 😀 Real Estate is more about the relationships we form with our clients, and assisting them with their goals. From the homeowners (sellers), we are asking that the home be available to show, that the home be clean, nothing of value is being left out, all medicines are put away and out of sight (not left in bathrooms or kitchen cabinets), anything that a seller wants excluded from the sale is noted, that sweet pups are either removed or kenneled, that sweet kitties are noted as inside only or inside/outside ok, and that please, please… homeowners (sellers) be gone for showings. As always, there is more to it than this, but that is a different class….and email. You can always call me for more information when you are selling your home. From the buyers….it gets a bit more complicated… before we go house shopping, we are asking that you have a pre-approval letter with a solid lender, we are asking that you do not look at homes above your price range, we are asking that you have thought about the Top Three things you want in a home (so we can show you homes that have those items you value most), and that you help us help you…. When a Realtor opens the lockbox to show you the home, we are taking responsibility for everything that happens from that moment on….until we lock up the house and put the key back into the lockbox. 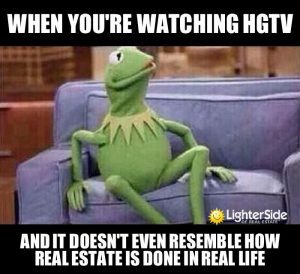 As I say all the time… Real Estate is NOT like HGTV… you don’t just get to wander the home while your Realtor sits outside… we must be with you at all times when touring your potential new home. Sometimes this can be like herding cats, but we understand your excitement… just please, please as you are touring the home, and we know you have your family with you, please…we must all stay together. Don’t make me sing to you here…..
As cool as those toys look, I’m sorry but the kiddos can’t play with them, and sorry…but you can’t jump on the beds either. It’s ok to open cupboards, and closets, but we can’t open dressers, or go through someone else’s personal items. Touring a home is a VISUAL thing….sorry. Yes, you can use the bathroom. When it’s wet out (which it hasn’t been lately), it’s always a good take off our shoes before we enter someone else’s home so be sure to wear easy on & off shoes. When we are looking at homes, often we have more than one home to look at, and many homes are owner occupied so your Realtor makes appointments. We do the best we can to make sure we have enough time to look at the homes, but we need to stay within our timeframes as the sellers are waiting to come home after we leave, or there are other Realtors waiting to show the home. I promise we are not trying to ‘rush’ you through the home…we are just trying to stay within the timeframes so that you can see the other homes on your list. With the real estate market being so crazy right now, it’s important that if a home comes up that you like, that you let your Realtor know as soon as possible so we can make an appointment for you to see it. Your Realtor should be sending you a list of homes as they come on the market for you to check….drive by the homes…check out those neighborhoods….and let’s make an appointment to go see the inside of the home. Like the neighborhood, but not sure about the house? Let’s at least go check out the inside! You never know as you can’t judge a book (or a house) by its cover. ASK QUESTIONS!! For heavens sake…this is a home you are thinking about buying… ask questions! As your Realtor, we are here to help! If we can’t answer your questions, we can at least set up in the right direction to get those answers. Buying a home is a very emotional experience. Your Realtor is here to point out pros/cons, and to help you…. Trust your heart, but use your head… or your Realtor. 🙂 Remember that we work FOR you. Thank you, as always, for reading this. Now, Memorial Day just passed, and as nice as it was to spend the day with our family….let’s take a moment to remember WHY we have this holiday….to remember our brave men and women who fought, and died, so that we can enjoy our time with our families. Memorial Day isn’t just about BBQ’s, fun, and family… it’s about those who have made the ultimate sacrifice. We Remember…. I hope this helps you this week! Please, if you have any questions, please feel free to call, email, text, or even facebook me anytime. I am always here to help! Information is power, and I hope that I am help you! Good luck, and as always…May the odds be ever in your favor out there…. If you are looking for a real estate agent, I would love to be able to help you. Buyers Due Diligence …what you need to know &….